This is a sponsored post from Groupon. All opinions are mine. As everyone clamors about the new iPhone 7, I am determined to get more mileage from my current model. Using Groupon Goods, I can find almost anything I need (sometimes things I don’t!) with a search and click of a button. To live with a fellow iPhone user is to live knowing chargers have a habit of walking away. 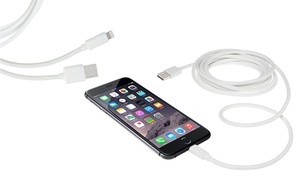 Groupon Goods has a great deal on Apple-Certified Lightening Cable Chargers. The chargers are 10 feet long and comes in packs of one, two, or three. Since The Boy isn’t the only charger thief (my sister and niece have no qualms about “borrowing” a charger and forgetting it doesn’t belong to them), so having the option to purchase multiple chargers without breaking the bank is a win to me. Groupon Goods has Apple Ear Pods with a Microphone at a decent price. I can make or receive phone calls with less chaos. The earbuds are also comfortable for use in the gym, when I binge on Netflix while the The Mister snoozes away, or listening to music while I pontificate (procrastinate) during my writing sessions at Starbucks. I love my Apple products, but love saving money more. Groupon makes it crazy easy to do just that! What do you love to save on with Groupon? Fun fact: My home phone number is older than my marriage!